For most of us who use a sauna from time to time in the gym, what powers the sauna or what it is built from does not matter. But in Scandinavia, where they take their saunas very seriously, sauna is a big business. Currently, in Finland, there is an ongoing intense debate about sauna rocks. Which rocks are best, what size of rock should be used and how hot is the right amount of hot for a sauna rock? Once you know that they take this sort of discussion very seriously in the land of the midnight sun, it should come as no surprise to discover that the Finns supply some of the best rocks in the sauna business. These are known as peridotite (peridotite is a dense, coarse-grained igneous rock, consisting mostly of the minerals olivine and pyroxene. 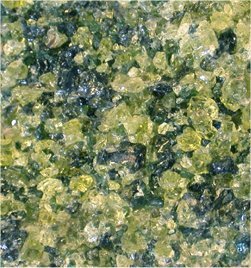 Peridotite contains less than 45% silica, is high in magnesium from the olivine and has about an equal amount of iron). Peridotite is quarried in Finland and shipped to sauna builders across the world. So what is it about the rocks that matters so much, and what type of rocks should one use for the perfect sauna experience? Sedimentary rocks or metamorphic rocks are not ideal, since they also degrade quickly. So that leaves us with igneous rocks to play with. Ah, but which igneous rocks? Glassy rocks of high quartz or iron content are not recommended. Quartz can actually explode when the water is poured over a hot stone which contains it. When someone offers you a sauna rock, you should try a simple test. Heat a sample rock for about 2 hours and then cool it down quickly by dropping it into a pool of cold water. When the rock is cold, check it for cracks. Next take a hammer and hammer the stone hard. If the rock cracks or makes a grinding noise, find a new supplier. Try to kit your sauna out in dark minerals, for example diorite (a grey to dark grey intermediate igneous rock composed principally of feldspar, hornblende, and/or pyroxene), peridotite and hornblende (hornblende is not a recognized mineral in its own right, but the name is used as a general or field term, to refer to a dark amphibole. Amphiboles are rock-forming inosilicate minerals containing iron and/or magnesium. Amphibole is the constituent of igneous rock such as granite, diorite, andesite) They contain both iron and magnesium which means that they will conduct heat efficiently. Other rocks, for example freshly quarried black basalt, are also excellent for sauna. And the contrast between the stones and the pale wood of the sauna walls looks pretty good too. Now that you found your perfect sauna stone, you can relax. Well not quite yet, since you still haven't considered the size and the shape. The best sauna rocks are about the size and shape of a medium potato. Bigger rocks take too long to heat up and if the rocks are too small they will give up heat too quickly. Rounded rocks (for example rocks from the river) are better but rocks gouged directly from the quarry will work just fine. One thing to remember is more rocks is not better. Rocks need to be arranged loosely to allow for optimal air circulation. Rocks are normally heated to about 500 to 800oC although measuring the temperature is not essential. If the rock temperature is too low, the sauna will just steam up, and the water will bubble on the top of the rocks. At the correct temperature the rocks will turn red when heated and when you throw water over them they will sizzle, followed by a blast of steam (You won't see the steam of course. Any sauna fundi will tell you that real steam isinvisible. The other stuff is just water vapour.) Got it? Perfect - you and your sauna are now ready for each other!